I think a graphic novel still counts as a book, especially a graphic novel as fascinating and informative as this one. As a woman, the sexist views of the Islamists made me angry. One panel shows an Islamist on television saying “Women’s hair emanates rays that excite men. That’s why women should cover their hair.” If that isn’t the most ridiculous thing I have ever heard! This was a very raw and candid portrayal of a young girl’s life. 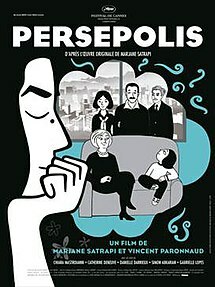 Satrapi didn’t really try to sugarcoat anything. I liked the precocious child, Marji, who was trying to understand the world that was going on around her and wasn’t scared of questioning the hypocrisies she witnessed. Her self-realization as she tried to determine her identity in Austria and when she went back to Iran and was perceived as an outsider and a worldly woman also held my attention. It made me think of people,especially children, living in other war-torn places such as Syria, what must they be going through everyday? What must they be witnessing? Torture, death etc? How can someone get over that?